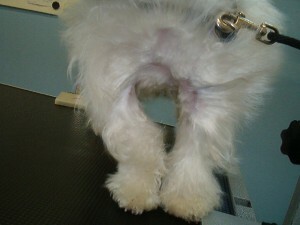 Why does my dog shake in fear going to the groomers/vet? A very common occurrence in vet clinics and grooming salons around the world. 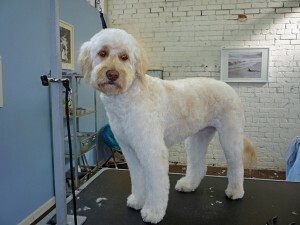 I have heard some owners suspect foul play at with previous groomers and after a visit they were shaking in fear. It’s sad to say that this story is a common one. 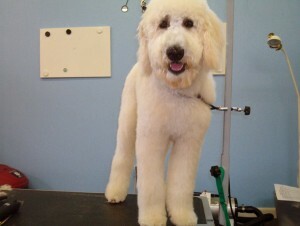 Go with your gut, if you suspect something odd try another groomer until you are fully comfortable. I know that deep in my heart I can go to bed comfortably without guilt of being rough with a dog. 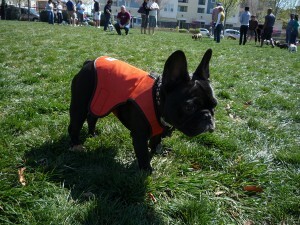 I have no qualms about turning business away if a client would require me to rough to a dog just to complete a service. This is merely an opinion of observation in my years of grooming. I do see dogs come in shivering not wanting grooming and when I get the question “Why are they shaking?”, I can only say that they don’t want to be here. Every time they visit me, they gets things they don’t like done like nail trimming, ear plucking, teeth brushing, ear cleaning, dematting, blow drying, nail dremel, etc. The the association is negative since they don’t get home practice. Dogs that are handled often like show dogs or dogs who I work with weekly are fully conditioned, some even go to weekly classes to perfect their manners to prepare for their days front of a judge. The dogs you see on TV dog shows come with hours of practice getting handled by strangers/handlers/trainers/judges, tails lifted, lips (flews) lifted, stacked, ears handled. 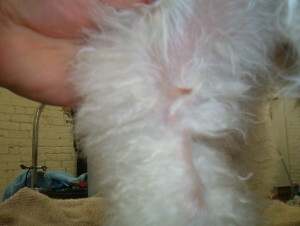 Its very routine and they don’t blink an eye with dremeling their nails since its done weekly nor shake in fear. Its about making it positive and PRACTICE. I do have owners who requests not to do anything their dog protests to avoid fear at the groomers. Same concept when going to the vet which included pricking, prodding, rectal thermometer, ear medication, etc. I made sure to start very young with our dog by teaching them that vet=treats and nail trims=treats. He loves going to the vet, they give him liver treats, hugs and lots of attention forgetting about his past stomach surgery, abscessed drained with a syringe among many other dreaded ER visits. Another thing I witness often is when an owner who is nervous about leaving their pup for their short visit unknowingly projects their fear onto their pup. The fear is sensed by the pup, it shivers which then makes Mom/Dad shiver in voice saying “oh no he’s shaking” then pulling them back into their arms with more quivering on both parties. As their leaders, they look to us for guidance and structure. If the leader is scared/weary/worried then what message does that leave a your pup. Like with humans, nervous parents are more prone to having nervous children. I see the similarities with dogs and owners just as often. 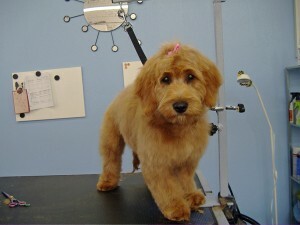 If you feel fully confident and have a good understanding, trust,and relationship with your groomer. The best thing to do is be positive and leave with confidence yet promptly to avoid moments of fear. I cannot tell you how many times I have to wait until the owner walks out of the door for the dog to stop quivering and walk confidently along side me to the tub. Its almost like a game of bluff, as if the pup is saying “Darn, they didn’t fall for it..ok lets go to the tub and get started”. When you return, reward with their extra special item (special treats, stuffed Kong or ball). Hopefully they might associate groomer or vet with one of the most important rewards ever in their eyes. I know its matted but I don’t want it shaved…. I recently had this happen with a terminally ill standard poodle. The owner was firm that shaving was not an option but to put the poor sick dog through hell was something I didn’t know how to address? I will not torture dogs for vanity regardless of money. Dematting can be safely done within reason. This poor dog was in bad shape with foxtails embedded in mats, nails that looked like cashews, ear lobes covered in wax and so on. This pet was in the same condition on its last visit except it got shaved. Dogs need a voice and when they need help its our duty to speak up. I knew I couldn’t do this job in its entirely without inflicting more pain onto the dog plus go against my ethics. I also make it known in my price sheet that I will only do a maximum demat of 1 hour, this dog needed 3 or more. 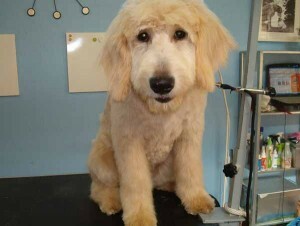 After3 baths and trimming the hair out of the eyes I decided to do what was good for the pet and let the owner continue the work at home to achieve the results they are looking for and to bring back those results after they were achieved. There are many tips to getting the look that you are trying to achieve with your pet so that you don’t run into these same scenarios. Fine tooth comb, nose to tail, every other day. If you are using a brush of any kind without a comb, there is a huge percentage that mats at the roots and will limit the outcome at the groomers. Groomers are like hairstylists, if you don’t comb your hair in the morning for months and go to your barber/stylist and want a fancy hairstyle. They might not get you the exact look but will get you started into the direction that you are trying to achieve. Doodles of every kind are becoming more popular since 1980’s. Just recently the “inventor” publicly regrets what he started with this combination. They are being sold with the idea that they are hypoallergenic which I have yet to find. No dog is 100% non-allergenic, but some dogs are basically “low-allergy.” Though they shed little to no hair and less dander than typical dogs, all dogs will shed some dander – even hairless dogs. Its great marketing and if you study coats, you have to smile. The coat is high maintenance that maybe won’t shed on your couch but will empty the wallet and your time of up keep on a daily basis. They have a good personality and are sweet dogs. Groomers all over the country dread them but not for the breed itself but from the lack of proper coat up keep done at home with pleas of “Don’t make him look like a poodle” even though he is part poodle. They come in every size and different coat textures and colors but one thing is united, 98% of them have mats that come into the salon. The idea that they don’t shed isn’t entirely true but it definitely sells on a marketing standpoint. Dogs that shed will do so on our clothes, upholstery, furniture. 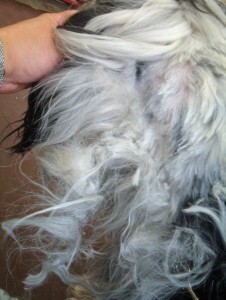 Hairy dogs that “don’t” shed, get matted. The hair is dead and gets trapped into the live hair instead of falling onto your belongings and starts its process of matting up, only taking 48-72 hours to do so. Combing from root to tip, head to tail will prevent this every other day. Another helpful tip is a rolled leather collar to help prevent matting around the neck area versus a traditional flat collar. Doodles are great dogs for the right people and you will definitely be seeing them more so in the future. I swear I brush and the next day its matted…. 90% of clients have this problem with high maintenance coats. Unfortunately most the time the coat is surfaced brushed and each stand is not being separated properly especially near the roots. Top layer is mat free and then as we get deep into the sections, our combs can’t penetrate. Here is one solid matted piece. This is a haven for fleas, fungus, bacteria among other skin problems. *I went out of town–Leave them with someone who can adequately care for them internally and externally. *He/She doesn’t like it or cries–Repetition, consistency, practice two times a week with positive reinforcement will help. For some it may have to be done every other day and for others once a week. Imagine our hair if we didn’t comb it. In fact I did get a call from a father whose daughter was in a very serious car accident with serious head trauma. 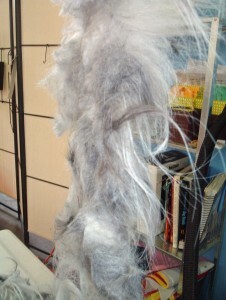 The blood and hair not being brushed for days became matted. They wanted my help on tips how to help. Same concept except with water, dirt,sand, dander, saliva or food caked into the hair. 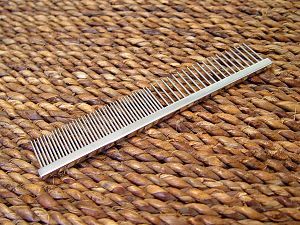 Depending on the hair texture, find your spot where the comb can’t go through then use a slicker brush to break apart the mat. You can use a de-tangling spray from a pet store which will lube the hair shafts to help slide out tangles better. I usually let the spray sit in for 10 minutes and work on a different section in the meantime. Back again, go with the comb, if the comb gets stuck then get the slicker brush and break apart and then comb to see if you got it out then back again. Needless to say this is very time consuming and the reason why some groom shops shave instead of demat or apply demat charges. And severe cases only option is shaving. There are mat breakers which are great but keep in mind you have a row of razors with a handle and if you don’t know what you are doing, your dog may need stitches. My dog is hot, what should I do? This happens very often every summer, dogs come in for their summer shaves. Some clients give feed back that their dog acted so happy like a puppy and others tell stories of how they hid under the bed for a week. I also noticed that your pet will react to how you treat them after they are shaved, if you hate it they can sense it but know that it will all come back in a matter of weeks. Stay positive. In my best opinion, I feel it is something that is you may want to research or think about if you aren’t totally sure. I once was told by a vet in Dallas that the hair will protect them from the sun and rays, keeping them cool where Texas summers hit 100 degrees plus until September. His words were,” A bald guy on the golf course will get hotter faster than the guy with a head full of hair so they need their fur for protection”. It made total sense and I never forgot it. Keep in mind dogs cool off by panting and sweating through their foot pads which sometimes is pressed against hot pavement. Cooling off also includes a belly against the dirt, grass or cold floor. 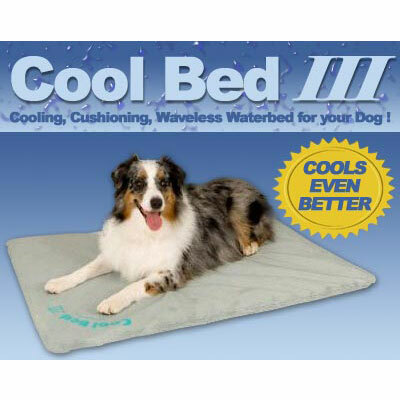 Even the longest-coated dog can be comfortable in hot climates. The hair on a well-groomed dog will actually keep him cool – because it acts as insulation against the heat. As long as the pet is healthy, even heavy-coated breeds can be comfortable all summer because after the undercoat has been shed, the outer coat provides insulation from the heat and protection from the sun. The best thing to do is keep the undercoat brushed out, don’t let it cake up. Matted coats will trap heat and moisture, causing redness, irritation and odors. Always provide shade and fresh water. For inside the house, a cooling bed can be found at many pets stores and online.